Severe storms can create high winds, lightning, and hail that can cause shingles to be ripped off from roofs, trees to fall on your house or garage, and propel debris through your windows and walls. Any storm damage should be reported immediately to your insurance company. Call Rapid to help to protect your building’s integrity and prevent secondary injuries. 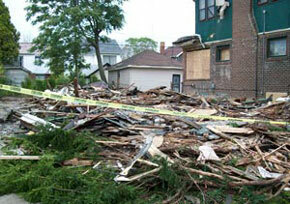 At Rapid Recovery Service we strive for customer satisfaction and quick emergency response. Our Storm Damage Recovery teams are available 24-7 and will arrive onsite for any expert storm damage repairs, in most cases, within 1 hour. We work with all insurance companies to help restore your property following Hurricane disasters.